People sometimes ask if they’ll be able to keep their tax refund after they file for bankruptcy in Rhode Island. The answer is generally yes — in most cases, an attorney experienced in bankruptcy will find a way to protect all but the largest tax refunds from being lost to creditors in a bankruptcy. IMPORTANT! the most common issue we’ve seen people encounter with tax refunds and bankruptcy is NOT with finding ways to keep the refund. Instead, it’s with people using the refund funds to pay back loans inappropriately (at least from the court’s perspective) around the time they file. To protect the tax refund, attorneys often make use of something called the wildcard exemption, which allows you to protect your cash and other miscellaneous assets through a bankruptcy. How much of your refund you can protect depends on several factors, such as whether you’re trying to protect real estate, and whether you elect to file with the federal or state exemptions (explained below). Is my tax refund too big to protect? When you go to file a Chapter 7 bankruptcy in Rhode Island, you’ll need to make a decision as to whether you’re going to use the Federal or State exemptions. Each has advantages and disadvantages. But you can’t use both in the same bankruptcy. Rhode Islanders typically use the state exemptions when they’re trying to protect their home equity (up to $500,000). 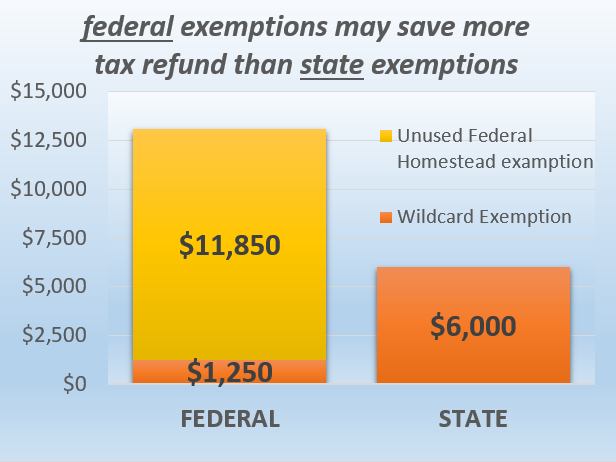 If you go this route, you may opt to use the state Wildcard exemption to protect a tax refund up to $6,000. On the other hand, if you’re not trying to protect real estate it might make more sense to use the federal exemptions to protect up to $13,100. And if you’re married, you may be able to double the amount covered under the federal exemptions: $26,200! In the RARE case that you’re trying to protect real estate AND use the federal exemptions, it gets a little more complicated. But you’ll still end up being able to exempt at least $1,250 in addition to up to $11,850 of the federal homestead exemption which you didn’t use. Moreover, these are general principles and the amounts available may vary depending on other circumstances of your individual case. For example, if you’re also trying to use the wildcard exemption to protect other assets (e.g. a savings account), less will be available to protect your tax refund. Also, we didn’t really discuss how this applies to Chapter 13 (payment plan) bankruptcies. Be careful about repaying personal loans with a tax refund! It’s an issue because you’re giving one creditor (your dad) special treatment over the others (the credit card lenders). And to the trustee assigned to oversee your bankruptcy cases, this isn’t okay. In this example, your dad may be required to pay back the money to the bankruptcy trustee. Instead, it’s often simply better to save yourself a headache and simply protect the tax refund with your exemption and wait for the bankruptcy proceedings to be completed before using any money to repay family loans. At that point, the legal obligation is eliminated, but then it’s okay to pay back the loan (even though the legal obligation was removed via the bankruptcy). And it makes for a better thankgiving family dinner as well.